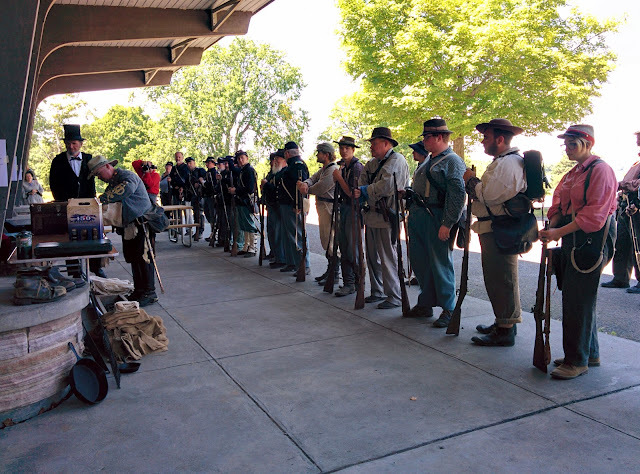 At last year's Civil War Weekend at Robert Moses State Park in Massena, I attended with the director of the museum as a kind of deputy - running errands that needed to be run, taking pictures so we would have something new to use in publicity next year, and so on. This year, it was all on my shoulders - the preparation leading up to the day, and the on-site work during the reenactment. 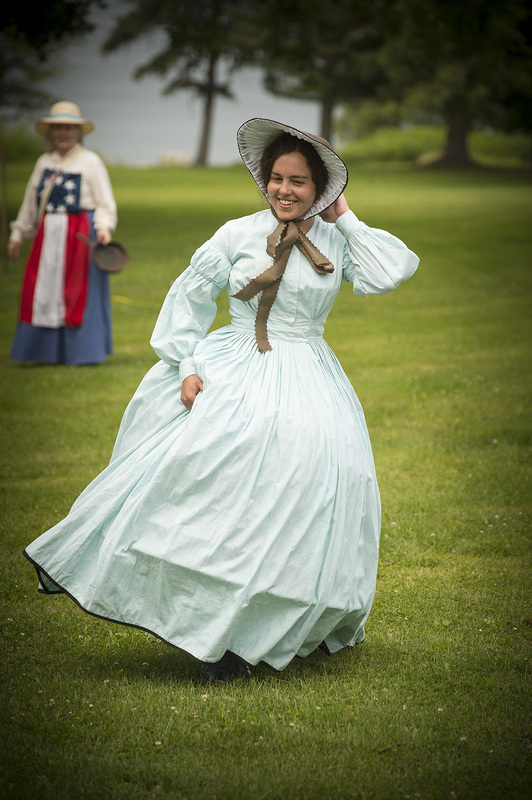 This is a picture taken of me last year - I wore the same secondhand dress this time, but with all the new underthings I've made for the HSM, so you do not actually see each rung in the hoop, even when the wind blows. I also have a new bonnet: a straw Flora Francine form from Timely Tresses, trimmed with ribbon from Bulldog and Baum. New pictures ... someday, if someone else took a picture of me and I find it! It was definitely an experience. You really don't realize how much goes on in the months leading up to an event until you live through it: permits, sending the insurance information a half-dozen times and having to keep getting other people to tweak the wording, arranging for hay and firewood, getting numbers so you know how many people to expect, writing press releases, arranging for new catering for the dinner when the original provider takes ill two days before ... There is so much wrangling to do over email and over the phone. And then on the day(s), there are waivers to get signed, speakers to hurry along, and events to emcee because you forgot that nobody else was booked in to do it. And all along the way, you notice or are told about the things you forgot to address or addressed incorrectly, which can't be fixed for this event. While working on this completely exhausted me - I'm an introvert, and over a long enough period of time simple socialization becomes heavy emotional labor - it has left me with a lot more confidence in my abilities. Now I will never forget who I should contact first if the caterer drops out, what order dinner and camps closing should be in, which speakers cannot go first because they run long, and so on. Next year I will make different mistakes, but I certainly won't make these (and I'll never print a folded single-sheet program on a long-edge bind ever again). And I actually feel like I could run any kind of reenactment now! Congratulations, you did it! Next year will be so much easier, as will subsequent historical events!